Asia Insurance Review’s annual breakfast roundtable in Sydney with some nine leading insurance industry professionals touched on myriad topics of importance to the market which include being customer centric, winning trust, sustainable underwriting, capacity, data analytics and the industry’s reputation amongst others. Specialist insurance journalist Kate Tilley reports. 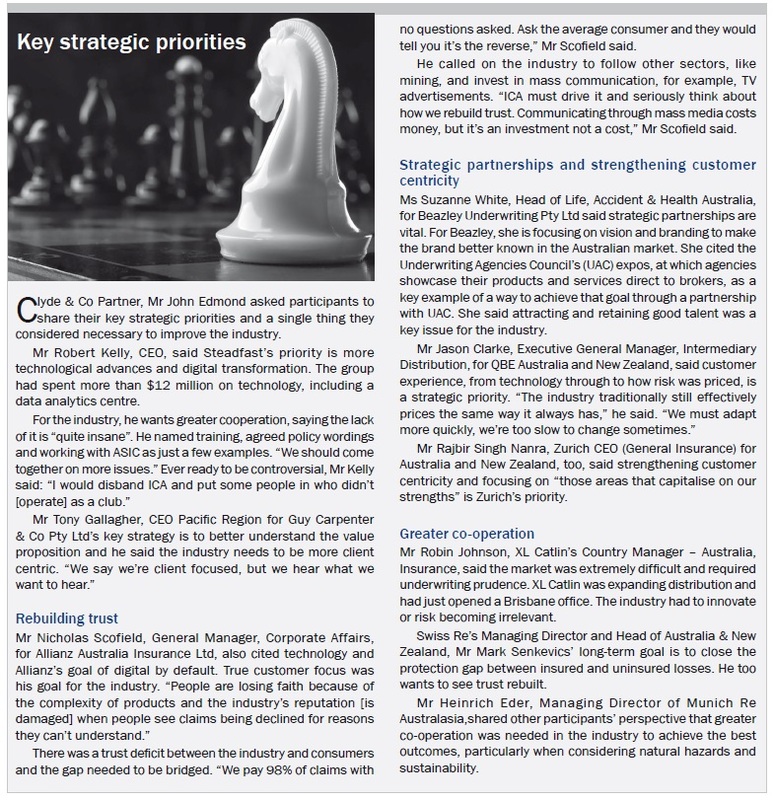 Rebuilding trust in the industry and being more consumer centric are key goals for the Australian insurance industry. 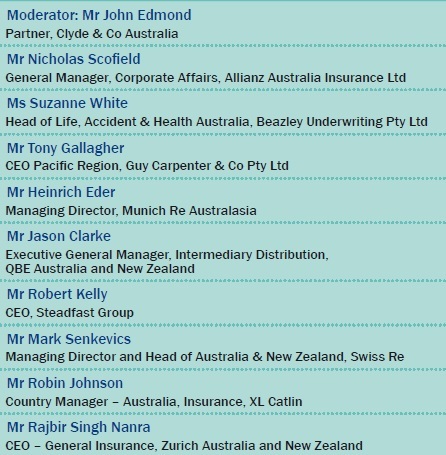 That was the consensus among nine senior industry executives who gathered for the annual Asia Insurance Review breakfast roundtable. The discussion was moderated by Clyde & Co Partner John Edmond, who guided the group through an array of topics in a free flowing and at times robust exchange of views. He launched the discussion saying industry data showed Australian insurers and reinsurers’ net profit fell 42.2% to A$2.4 billion (US$1.8 billion) in 2015 as claims from storms and bushfires took their toll. “Combined ratios are weakening and investment returns are negligible. Is that a worrying trend?” he asked. He was a staunch advocate for change, and said current pricing was “insane” and “reinsurers are almost paying people to do business with them”. 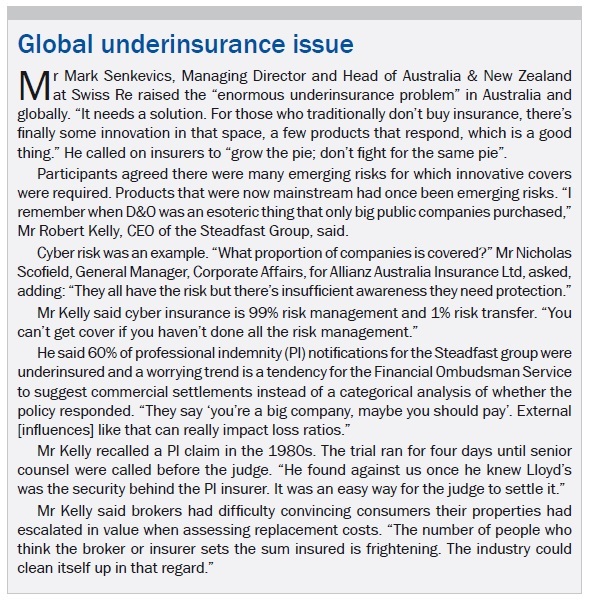 Mr Nicholas Scofield, General Manager, Corporate Affairs, for Allianz Australia Insurance Ltd, said it was important to look at both sides of the market – domestic and commercial. The soft market in commercial business was “a concern for us and everyone else”, he said. There were also challenges ahead with the introduction of new terrorism reinsurance rates and reforms to the NSW emergency services levy (ESL). When the Victorian fire services levy reform was implemented from 1 July 2012, insurers sought to “taper up a bit beforehand to offset under-collection later in the transition year, but that may be harder for NSW ESL reform in the current commercial environment”. Mr Rajbir Singh Nanra, Zurich CEO (General Insurance) for Australia and New Zealand, who was appointed in January after four months as interim CEO, emphasised the overall importance of sustainable underwriting. He said Zurich, at the end of 2015, had examined its internal cost structures in response to market conditions and implemented a strategy that emphasised driving sustainable underwriting profit. “This has seen investment and focus placed in areas of core strength,” he said. He said insurers had to examine costs and “how we deliver to the market; that’s where the focus really has to be”. Mr Nanra agreed, saying insurers wanted a market that was sustainable and predictable but there was too much volatility in the stock markets and big investment returns could not be expected. Mr Heinrich Eder, Managing Director of Munich Re Australasia, said 2015 was not a volatile year for reinsurers in terms of claims, particularly compared with the “extreme” years of 2010 and 2011. Last year was benign, apart from some large man-made losses. The August explosions at the Port of Tianjin, in China, are estimated to have cost insurers more than US$3.5 billion, and the collapse of two dams in south-eastern Brazil in November have been estimated at up to $700 million in insured losses. Mr Mark Senkevics, Managing Director and Head of Australia & New Zealand at Swiss Re, said the company’s latest sigma report on 2015 natural catastrophes and man-made disasters showed the year’s insured losses were $37 billion against a 10-year average of $62 billion. He said that had driven reinsurance profit because Nat CAT premium was “falling straight to the bottom line”. “It’s a substantial gain, but if it moves back to average, reinsurance profit is largely gone,” he said. Mr Edmond asked if the traditional insurance cycle was dead. 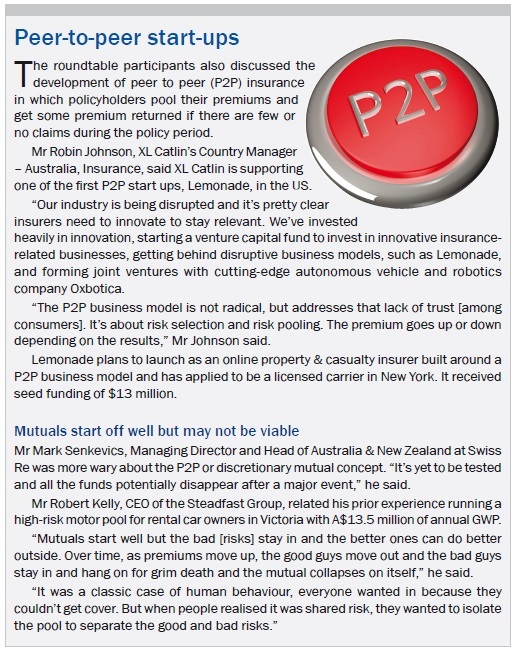 Mr Kelly said during a soft market insurers ignored loss ratios and sought to increase gross written premium (GWP). But when poor risks were being corrected or rejected, his four decades of industry experience suggested that signalled the start of a hard market. “It is happening,” he said. Mr Senkevics said in the past it had taken “a profound event to shift market dynamics because capital was sucked up by that one event”. Today it was “death by 1,000 cuts”. Mr Eder warned it was a false dream to think there were no big CAT events on the horizon. “In our business, we must expect the unexpected.” For example, there was potential for a category five cyclone, similar to Tropical Cyclone Winston that hit Fiji in February, to affect the Gold Coast and Brisbane. “Earthquakes also occur in Australia and we have a magnitude six quakes every five years. Are we kidding ourselves? And, with climate change, as the temperature gets hotter, there will be more bushfires,” Mr Eder said. Participants questioned what it would take to shift rates upwards when there had been no real movement, despite catastrophic events in the past 12-18 months, including the Brisbane and Hunter Valley storms. The November 2014 Brisbane hailstorm’s losses are estimated at A$1.1 billion and Hunter Valley storm losses at A$500 million. On top of those events, the Insurance Council of Australia (ICA) said the combined cost of the four catastrophes it has declared since November 2015 has passed A$550 million. Those events were South Australia’s Pinery bushfires (26 November), the Sydney tornado (17 December), the Great Ocean Road bushfires in Victoria (26 December) and the bushfires in Western Australia’s south west (8 January). Mr Senkevics said the latest catastrophes had not reached insurers’ reinsurance levels “but it’s hitting the profit & loss accounts for primary insurers”. Mr Scofield said with “the amount of capital in the reinsurance market globally, we would need two or three Hurricane Katrina-sized events to absorb enough of that capital” to see reinsurers forced into a hardening. “It’s hard to see anything short term that’s going to move the dial,” he said. He said if rates hardened it was “a bonus” but structural issues, like technology, “how we transact business”, and inefficiency were key problems to be resolved. “It’s a clumsy business in many ways; we have just hung on in the past and waited for the hard market. Investment income is the [sticky] tape that hides a lot of stuff. To get combined ratios where they should be, that is, below 90%, is achievable, but [some] companies won’t survive, there’ll be a bit of a shake up and more merger and acquisition activity,” Mr Gallagher said. Mr Johnson said brokers’ use of technology had driven “massive change in distribution models as they’re increasingly able to aggregate information to enable portfolio deals to be done, creating efficiencies for both sides”. But Mr Gallagher said technology, particularly mobile devices, had generated “a different type of relationship”. Mr Nanra was curious about Australian insurers’ use of data on consumers’ buying patterns. “That can give you a different lens on the data,” he said. Mr Senkevics raised the need for portfolio optimisation and dynamic pricing to reach the required demographics. That sparked debate among the participants about an ABC Four Corners television programme that had aired in March. The ABC said its programme exposed a life insurer for “unscrupulous tactics to take consumers’ money and avoid insurance payouts, leaving customers paying money for nothing at the most difficult moment of their lives”. It cited examples of claimants whose total & permanent disability and trauma claims were denied on spurious grounds. The programme has generated an Australian Securities & Investments Commission (ASIC) inquiry into life industry practices. Roundtable participants agreed the industry’s reputation is a problem. Mr Scofield said: “The customer perception is that the product is overly complicated and there are too many outs; they are losing faith. Insurers need to [re-examine] their products.” Consumers received 40 pages of terms and conditions and exclusions with a policy, which they viewed simply as “ways we can work out how not to pay”. “We need to be able to price the risk and have a handle on the exposure but, in current consumers’ minds, are they losing faith? We need something simpler and with more certainty,” Mr Scofield said. 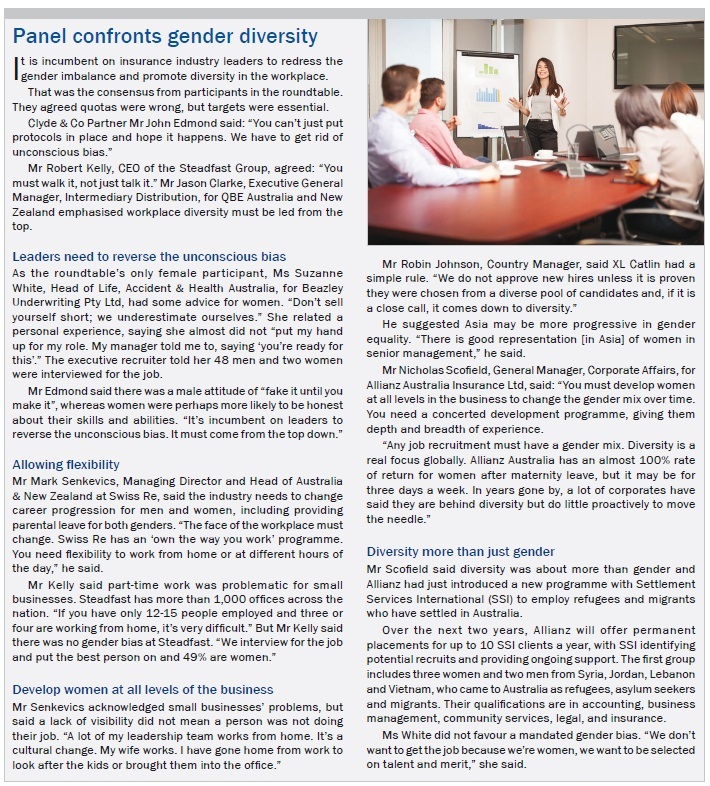 That raised a few laughs, but Ms Suzanne White, Head of Life, Accident & Health Australia, for Beazley Underwriting Pty Ltd, swung the discussion back to a serious element, saying the issue is customer perception. “It’s hard to achieve the balance, especially when you get into discrimination – we open the floodgates with mental illness,” she said. The most recent changes to section 54 of Australia’s Insurance Contracts Act were aimed at treating consumers more fairly. Mr Edmond said the UK’s new Insurance Act was “the Poms catching up with us on consumer-focused legislation; it’s mirroring the legal position we have had since 1985”. Mr Edmond said insurance was a grudge purchase and “bad stories get a lot of air time” in the media. Mr Senkevics agreed, saying “the media doesn’t like good news; trust is continually eroded because you’re not stacking up the positive stories”. However, he cited some consumer credit products with associated insurance as examples of poorly designed products and agreed with Ms White that the industry “needs to get ahead of the curve with mental illness”. Mr Edmond shifted gear to find out what the future held for the Australian market. Ms White said new entrants would not stop, but queried whether they would be around in five years’ time. Mr Kelly noted some had “already been and gone”. New entrants had to be “nimble and have flexibility”. Lloyd’s is seeking continuous improvement, including through an initiative called Project Tomorrow, which aims to streamline coverholder reports. Mr Gallagher said personal lines are seen as profitable business in Australia. He too, predicted more consolidation and new entrants into the market. Mr Scofield said some new entrants to the Australian market had been very successfully growing premium, but had massive marketing budgets so profitability was “a different story”.